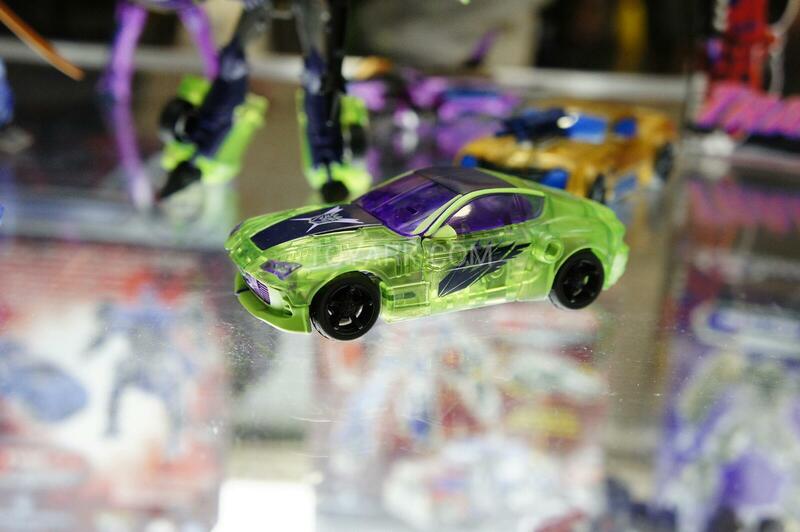 And now our final gallery for you tonight, display shots of the newly announced Big Bad Toy Store exclusive Dark Energon subline, full of many transparent plastic redecos of Transformers Prime toys. Check the images after the jump. 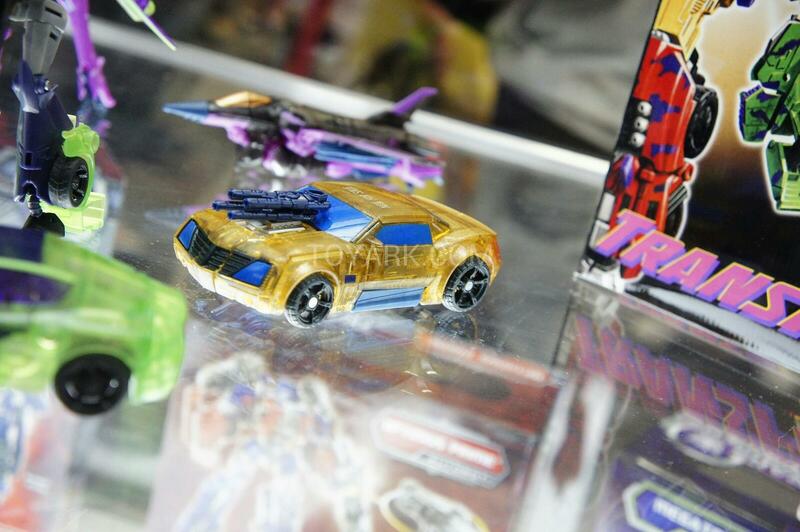 Also, swing by TFW2005 Sponsor Big Bad Toy Store for updates regarding this BBTS-exclusive run of toys. Keep it TFW for more updates, and check out our fellow sites Hisstank and Toyark for more SDCC 2012 coverage! 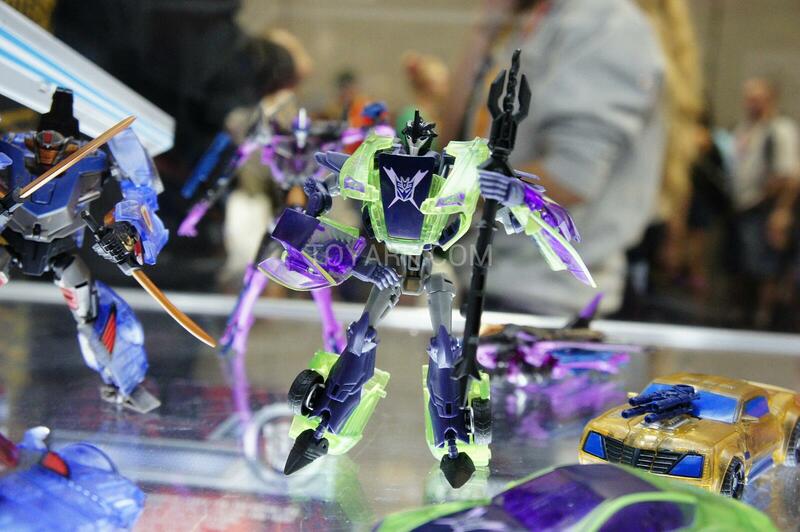 So, am I the only one who looks at BBTS Not-Skywarp, and immediately wants a translucent version in Sunstorm colours? Still, that not-Slicer Wheeljack is bought. Thanks for the extra Decepticon symbols AM Breakdown! 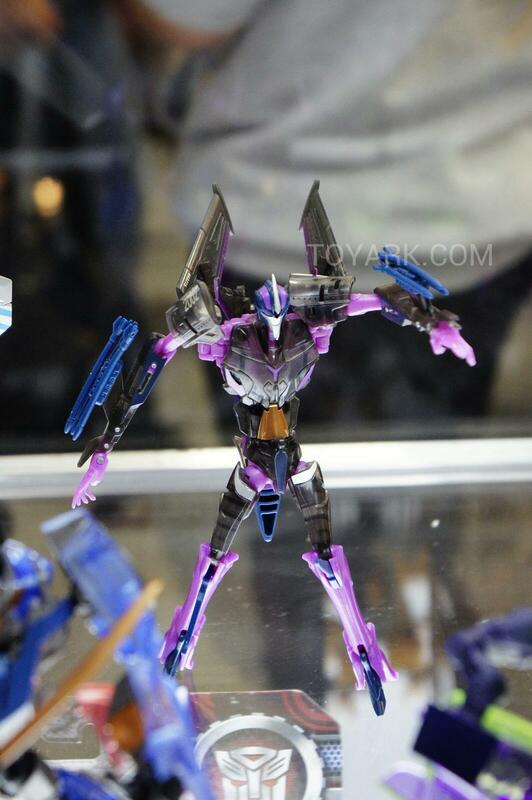 I was thinking translucent thundercracker, but that's cool too. Instead, hold out hope for a "Coronation Skywarp" or some such. I'd buy that. I'd buy that right now. 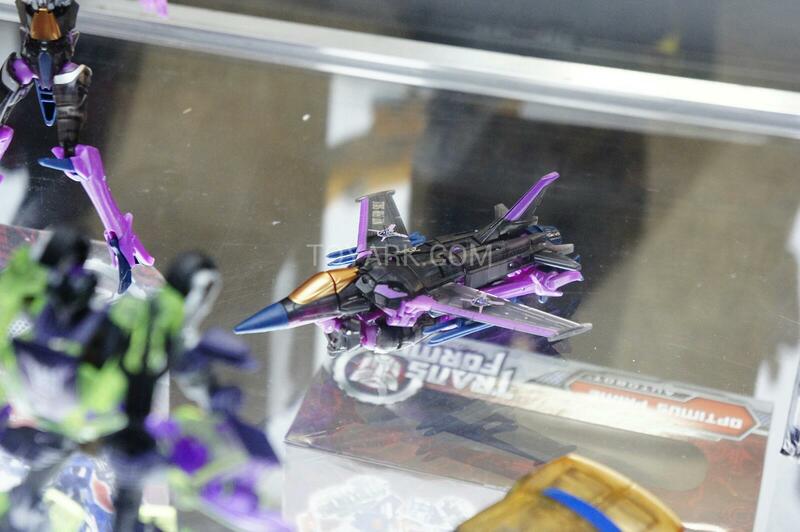 Damn… kinda mad I parted ways with my Hasbro MP Skywarp after seeing that Thundercracker… oh well. I can pick it up again if I decide to get them both. Don't be mad… with MP Skywarp having been the MP-3 mold, and Thundercracker being the MP-11 mold, they wouldn't quite match anyway. I mean, I don't know if you have the same insane collector OCD that I have, but that would honestly bug me. Instead, hold out hope for a "Coronation Skywarp" or some such. If I end up getting the TC, I may end up switching the windows with my ones from my MP-03 US SS. Do you guys think that that would look good? I suspect/hope for almost identical changes. Seriously–does someone at Hasbro like "boy shorts" or something? First MP Rodimus, and now MP Thundercracker—why do they keep *changing* the upper legs to be the same color as the waist armor, instead of leaving it like how Takara's been molding/coloring them? It almost looks like they're wearing hot pants when they do this. It's the main reason I never transform MP Hot Rod to Rodimus mode. 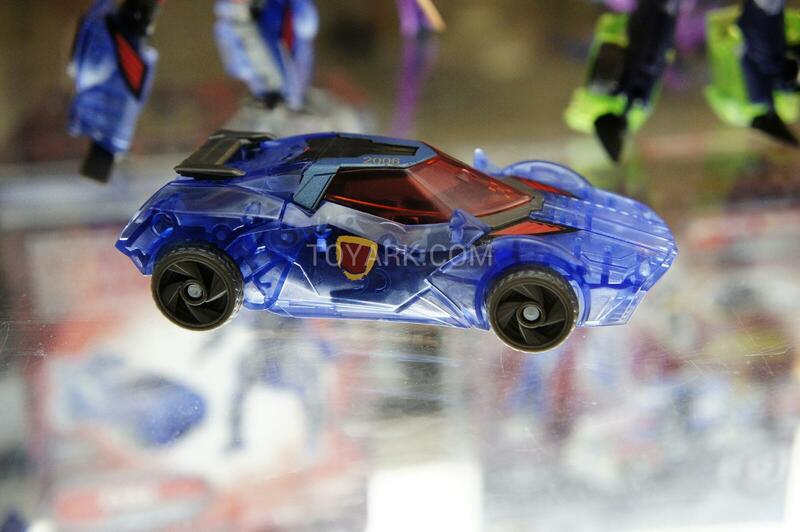 Of course, if Takara goes with anime pale blue, all bets are off. Needs to be a deep blue. (also, I still keep thinking Hasbro doesn't have much *black* on the figure, just lots of charcoal grey—Thundercracker should have BLACK accents, not dark grey) MP-07 had navy blue, now this one is grey. Is it that hard to use BLACK on a figure that should be black? TC's black is exactly where SW's purple is—it's the main accent color and part of their iconic look. 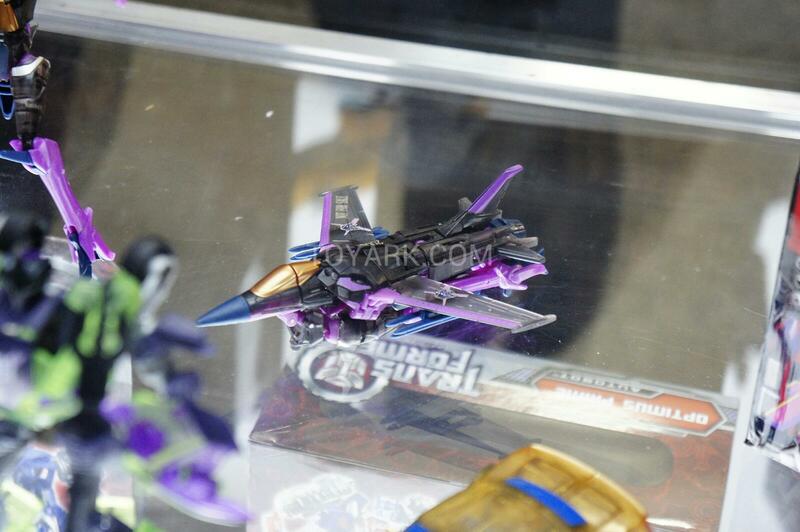 People expect *purple* on Skywarp and not "something close"—we should get *black* on Thundercracker in the same areas. 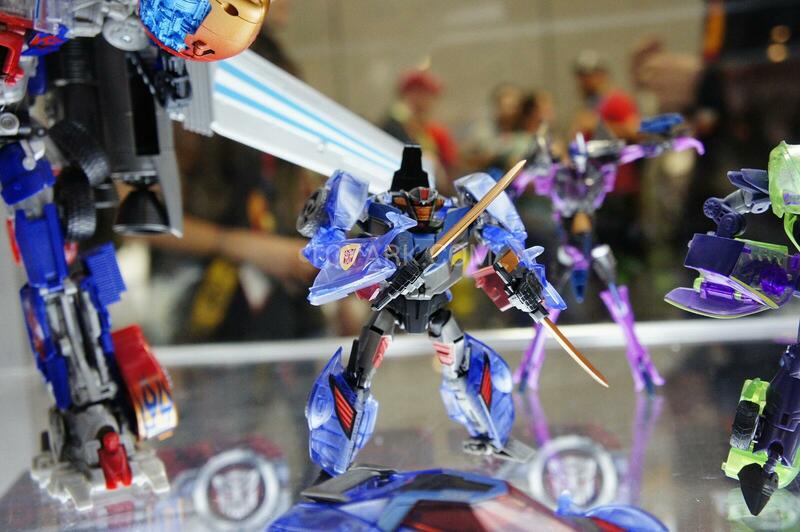 Those Dark Energon Prime toys are looking amazing! I gotta have Knockout and Screamer. Also bet he won't have those red stripes no his upper arms..! I might be in the minority here, but honestly prefer the original MP3 mold. Mostly because it hs a better looking jet mode. You're not the only one that likes the MP-3 mold that's why old mold = alt mode and new = bot will be how my display will be. I doubt that Takara is going to release TC off the MP-11 mold for under $70 so as far as being cheaper yes the TRU version will most definitely be. I understand the 'Sonicboom' decal on the tail, although it does look garish. But what's the significance for the 'tats' of Reflector on the shoulders? Also, I noticed an 'exclusive' sticker on the packaging, does mean that this is a store exclusive? I was never a big fan of the G2 colours. I'm passing on this Bruticus. Loving that Thundercracker is a MP11 repaint, but I'll have some light modding to do to get rid of some of the fugly added paint apps. None the less, I'll be picking up two. What's with the tail of TC which indicate "sonicboom"